In addition to your fixed blade knife, look into a quality lock blade. Here I recommend a Tanto style blade for strength. 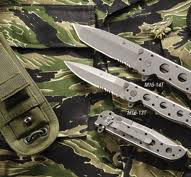 Benchmade, Cold Steel, and SOG knives are excellent choices in this category. Once again, they are the upper end knives. CRKT also makes a quality knife for less money. What I don’t recommend is picking up a Mega-mart green light special for ninety-nine cents, but it’s your life. Do as you see fit.